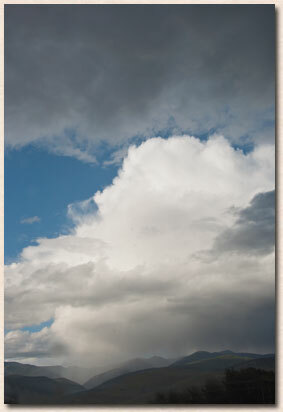 As I sit, gazing out the window of my flet, large clouds are building up over the mountains. They have the appearance of huge locomotives and they move with great power and speed. Billowy and steel colored, they carry the essence of life; water. Of late, we have been greatly blessed with a surplus of moisture. As we are surrounded by great forests of pine, fir, and spruce trees, forest fires are always a concern in my realm. Even though the rivers that run through my valley are full and moving at great speed, all of us who live here know what the month of August would be like if we did not have the extra moisture. I am thankful for this abundance, for while there is a danger involved, a blessing follows close behind. And so it is with the tragedies of life. Occasionally, we have to live through circumstances that we think are going to drown us in such pain that we simply can not go another step. However, if we simply ride the river and rest in the process, the blessing of a peace that passes all understanding will be the result. At long last, my long-awaited rose garden is complete. With great satisfaction, I stroll along the edge of it and sigh. It has been many long years since last I had any kind of garden. I love to lean down and pet their leaves and thank them for being in my garden. My hole digging for the year is finally over and the rest of the summer, I can play. Of course, there is the comfortable routine of spraying, cleaning off dead leaves, and harvesting beautiful roses. I have already been able to bring a few lovely blossoms into my cottage to enjoy. It is a treat beyond comprehension. I am truly rich. As I was trimming the flower spikes off of my tulips yesterday, the thought came into my mind that I really do live the beautiful life. Not all of the things in my life are beautiful, but living beautifully is an attitude. I humored myself when it came to me that rummaging in the dirt isn’t exactly beautiful but a thankful spirit is. My eyebrows shot up to my hairline when I realized that a grateful heart truly is the key to living the beautiful life. So I am relishing in the soft month of June; a transition between spring and summer. It is truly delicious. Every day is a gift no matter how the rivers of life rage and sweep me along. By an act of my will, I will ride the current just to see what is right around the bend. Actually, I think the words are, “by hook or by crook” I am letting life carry me along, knowing that it is the surprises that are the most fun.